FOR SUCH A TIME AS THIS: The November day of fasting and action is Tuesday, Nov. 21. This month, we focus on federal investments that make communities more resilient and better prepared for destructive natural disasters and the consequences of a changing climate. ELCA congregations and community organizations across the country work tirelessly to help when disaster strikes, most recently in Texas, California, Puerto Rico and the Virgin Islands. To prepare our nation for the future, our federal government must invest in research, urban planning and building infrastructure designed for the climate challenges of the next 100 years. DISATER RELIEF UPDATE: President Trump signed a disaster aid package on Oct. 26 to continue federal relief for hurricane and wildfire affected regions. While the $36.5 billion package included much needed funding for the Federal Emergency Management Agency’s (FEMA) disaster relief and the National Flood Insurance Program, the support package as passed is only a temporary solution, and funding for longer-term recovery programs will be needed soon. ELCA Advocacy and Lutheran Disaster Response shared an action alert last month in support of the bill, with hundreds of Lutherans calling for action. ELCA Advocacy will continue to encourage action for those affected by natural disasters as Congress considers a longer-term spending bill next month. DACA UPDATE: Last month, the White House released a series of immigration principles and policies outlining immigration recommendations for Congress to consider alongside legislation to protect young “Dreamers.” These principles include policies that take away trafficking protections for children, make it harder for people seeking protection to find refuge in our country, and reduce the ability of families to stay together. Shortly after the release of the principles, ELCA Advocacy shared an action alert encouraging lawmakers to support protections for young Dreamers without additional provisions. REFUGEE SCREENING: Lutheran Immigration and Refugee Service (LIRS), alongside ELCA Advocacy, is also continuing its outreach to Congress and the administration on screening procedures for refugees. This comes as the White House announced that only 45,000 refugees will be resettled in the U.S. next year – the lowest level in decades – and proposed other unnecessary screening policies. Five Wisconsin ELCA bishops will present more holistic refugee policy recommendations to Sen. Ron Johnson, R-Wis., later this month. HUMAN RIGHTS UPDATES: The U.N. General Assembly allocates to its Third Committee agenda items related to human rights issues and social and humanitarian affairs affecting people all over the world. 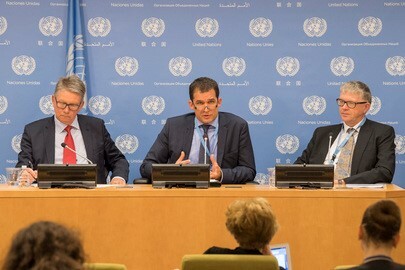 An important part of the work of the committee is focused on examining human rights questions, including reports of the Human Rights Council, established in 2006. During October, the committee heard and interacted with special rapporteurs, independent experts and chairs of the council’s working groups. The committee discusses the advancement of women, the protection of children, indigenous people, the treatment of refugees, the promotion of fundamental freedoms through eliminating racism and racial discrimination, and the right to self-determination. The committee also addresses social development issues in such areas as youth, family, ageing, people with disabilities, crime prevention, criminal justice and international drug control. 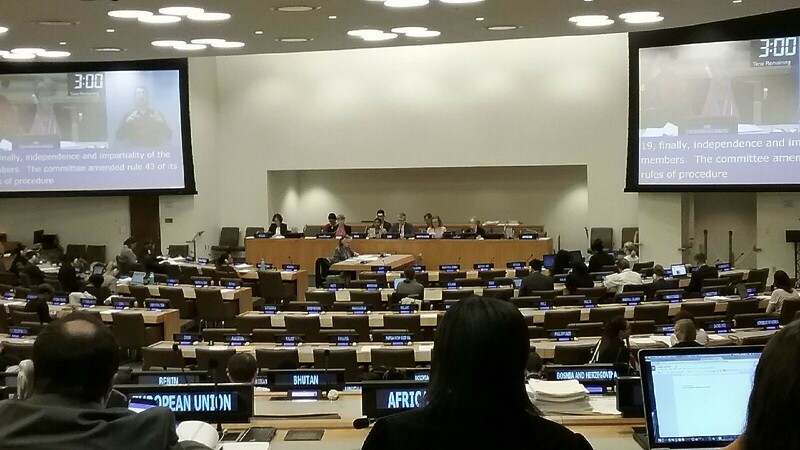 The committee has heard from more than 60 experts during this year’s session of the General Assembly. Compelling presentations included extreme poverty and human rights, rights of indigenous people and prevention of torture. In line with General Assembly resolution 66/246, formal meetings of the Third Committee are webcast live on UN Web TV in the six official languages of the United Nations. Past meetings of the session are also available from the committee’s video archives. SIMPLE, PRACTICAL MEASURES NEEDED: Experts told the Third Committee in October that member states and international organizations must take simple, practical measures to ensure inclusivity, as delegates debated the human rights of people with disabilities. The chair of the Committee on the Rights of Persons with Disabilities, Theresia Degener, said that budget appropriations were needed to provide such services as international sign language, national sign language interpretation, Braille, captioning, plain language and Easy Read as a minimum. Although the committee has a member with intellectual disabilities, it has not been able to provide that expert person with any information in plain language. Catalina Devandas Aguilar, the special rapporteur on the rights of people with disabilities, said the sexual and reproductive rights of women and girls with disabilities require urgent action. To identify and eliminate harmful practices, member states must provide families with access to legal mechanisms and, rather than simply facilitating care, consider the opinions of people with disabilities. States have an obligation to protect sexual and reproductive health and rights by ensuring comprehensive sexual education, providing inclusive health services and empowering people with disabilities. The committee also explored freedom of opinion and expression, among other issues, with the special rapporteur on that topic warning that public trust in information was under attack by political demagogues and those particularly purveying “fake news.” He cautioned governments against making, sponsoring or encouraging statements they reasonably knew to be false. D.C. STAFF VISIT: A highlight of October was the visit of Ruth Ivory-Moore, ELC A program director for energy and environment, for the annual Sierra Pacific Synod Hunger event at Lutheran Church of the Incarnation in Davis, an interfaith climate change symposium, and a forum at St. John’s Lutheran Church in Sacramento, where, with the farm bill getting more attention, she met Karen Ross, California secretary of food and agriculture. EARLY CHILDHOOD: LOPP-CA Director Mark Carlson participated in the annual Watercooler Conference of early childhood education advocates and providers, sponsored by the Advancement Project, a civil rights organization. Four leading gubernatorial candidates presented their vision for early childhood. The California First 5 Commission unveiled its resource to help young children feel safe and develop resilience in a time of heightened fear and anxiety fueled by anti-immigrant, anti-Muslim, and militaristic rhetoric and actions. The resource is available in English, Spanish, Korean and Arabic and has been shared with some church leaders. THEOASIS: Mark also participated in the Theoasis professional leadership conference for the Pacifica and Southwest California synods. LOPP-CA had a display that included care for creation and racial justice materials and joined a book discussion on “Strangers in Their Own Land – Anger and Mourning on the American Right.” It circulated a sign-on letter thanking Gov. Jerry Brown for approving SB 54, the California Values Act, which limits state and local law enforcement involvement in federal immigration enforcement, as well as other bills with the goal of providing due process and protecting immigrants from overzealous immigration enforcement at schools, workplaces and residences. SPECIAL SESSION: The Colorado General Assembly met for a special session at the beginning of October to address the unintended tax impacts of SB 17-267. However, partisan division left HB 17B-1001 dead on arrival in the Senate. We hope that this failure to reach a policy compromise will not portend similar results for next year’s regular session. HOUSING CONFERENCE: Lutheran Advocacy Ministry-Colorado was present for the Housing Colorado NOW Conference in Vail in mid-October. 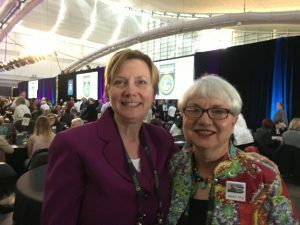 Affordable housing advocacy, possible budget cuts to the federal Department of Housing and Urban Development, tiny homes, and housing needs for those who’ve experienced trauma from homelessness were among the many topics discussed in workshops and plenary sessions. The event is Colorado’s largest annual housing conference and is invaluable for our upcoming policy work on housing in the 2018 legislative session. MINISTRY VISITS: We were honored to visit Lutheran Church of Hope in Broomfield and Lutheran-Episcopal Campus Ministry at the University of Northern Colorado in Greeley this month! Pictured are students from UNC and Aims Community College sharing a meal and conversation with LAM-CO Director Peter Severson. 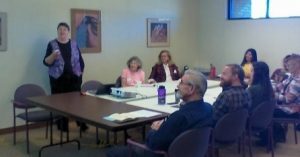 ANNUAL LAM-NM ADVOCACY CONFERENCE: Over 60 Lutheran advocates and their ecumenical partners met on Saturday, Oct. 14, at St. Luke Lutheran Church in Albuquerque. Breakout sessions included advocacy basics, tax policy, and hunger in New Mexico. State Rep. Liz Thomson, whose district includes St. Luke, spoke at lunch about her legislative experience. UNEMPLOYMENT COMPENSATION: Last November, faith leaders in Ohio gathered at the Statehouse to discuss a very bad and dangerous proposal that would have gutted our unemployment compensation system in Ohio. Unemployment compensation helps protect victims of corporate downsizing and layoffs from hunger and losing all stability. We need to maintain benefits at an adequate level and long enough to make sure people can get by until a new job is secured. However, legislators are concerned that our system will once again go bankrupt during the next recession. Luckily, our advocacy voices joined many others from around Ohio to stop the bad bill from a quick end of session vote. Representative Kirk Schuring unveiled a proposal in October that would increase revenue from workers and employers and adopt some cuts to benefits. While this bill is not perfect and has a long way to go, we appreciate Schuring’s improvements to the bill. GERRYMANDERING: Also, the General Assembly will consider a fix to gerrymandering in Ohio. Ohio’s 16 congressional seats are safe with 12 Republicans and four Democrats. This is unlikely to change because districts have been drawn intentionally to limit actual competition. The Hunger Network,and faith communities around Ohio are excited to work with the Fair Districts campaign toward restoring electoral integrity to our congressional elections. 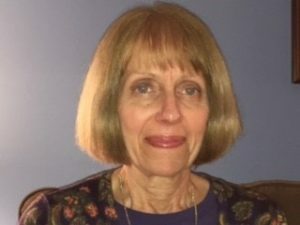 NEW PROGRAM DIRECTOR: LAMPa welcomes Lynn S. Fry, Chambersburg, the new program director for Lutheran Advocacy Ministry in Pennsylvania (LAMPa). She begins her work with LAMPa Nov. 6. Social ministry and advocacy are at the core of Lynn’s being. “Foundational to my life is my faith in the triune God, the knowledge that God has made us all in his/her image, and everyone is entitled to be treated equally with dignity and respect. Since my teenage years, I recognized and have been passionate about my life making a difference in the world in a positive way,” Lynn said. “I am thrilled to be bringing someone with Lynn’s many gifts and deep roots in Pennsylvania Lutheranism onto LAMPa’s staff and eager to introduce her to our wonderful advocates across the commonwealth,” said LAMPa Director Tracey DePasquale. Those advocates were particularly busy in October, responding to harmful proposals in the last hectic days of a more than three-month-overdue budget. In addition, hunger advocates signed their feeding ministries on to a letter requesting that Gov. Tom Wolf remember anti-hunger funding in his budget proposal for next year. Hunger leaders also a ccompanied Tracey to a statew ide hunger coalition meeting as well as an update by the Governor’s Food Security Partnership on the Blueprint for a Hunger-Free PA. Other Lutheran advocates joined Tracey at a three-day Climate Reality Leadership Training in Pittsburgh. Tracey was also pleased to serve as keynote to the Allegheny Lutheran Social Ministries annual dinner. LEADERSHIP CONVOCATION: This month we attended our Synod Leadership Convocation at Lutheridge in Arden, N.C. Mark Hanson was our keynote speaker; he used a conversational format to talk about how we connect the biblical narrative to our leadership and ministry. Everyone in attendance had the opportunity to re-think and refresh their ministry. Hilton Austin, synodical director of advocacy, set up our advocacy exhibit with a focus on support for the Dream Act 2017, along with our continued effort to develop congregational advocacy teams across the synod. We also had the opportunity to bring together leaders developing the Gaurdian Angel program for the Atlanta Immigration Court to discuss the path forward and how we might work with Mary Campbell, ELCA AMMPARO, to provide the necessary training. The weekend following the convocation, Hilton, along with Megan Neubauer, ELCA Domestic Mission, and Everett Flanigan, assistant to the bishop, facilitated a Leadership/Advocacy conversation at Christ Lutheran Church in Nashville, Tenn., with leaders from Christ Kiswahili congregational leaders. This was the second in a series from the ELCA Leadership Initiative. IMMIGRATION HEARING: The Virginia Interfaith Center for Public Policy mobilized people of faith to accompany José Luis Lugo Zarco and his family to his hearing in immigration court on Oct. 26. Unfortunately, his case was continued again. He has been in the U.S. since 2002; he is married to a U.S. citizen, Angeles, and they have two U.S. citizen children, 4 years and 6 months old. The only infraction on his record is a ticket for driving without a license. (Virginia does not allow undocumented people to obtain a license.) He unfortunately came into contact with Immigration and Customs Enforcement due to that infraction and has since been in removal proceedings. 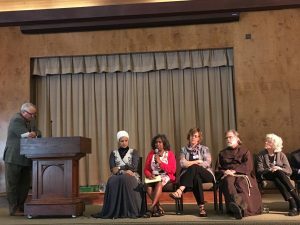 The Interfaith Center is organizing the Central Virginia Sanctuary Network, a network of congregations that are willing to provide support to neighbors, friends and family who are being detailed, deported or profiled. In the face of hate and discrimination they are committed to showing love, compassion and hospitality. Learn more at here. The Center is a co-sponsor for the 8th Virginia Immigrant Advocates Summit, which brings together statewide immigrant rights advocates, partners, supporters and allies to learn, discuss and strategize on issues that affect immigrants in the commonwealth. The event will be Nov. 15 from 8:30 a.m. to 5 p.m. at Faith Lutheran Church in Arlington. VICPP’s Northern Piedmont Chapter hosted a community roundtable discussion on heath care on Oct. 18. FEDERAL: Now that the House and the Senate have passed budget resolutions and committees are working out the details of tax cuts, FAN is focusing on how cuts to federal human-services programs will affect vulnerable Washingtonians. We’re encouraging advocates to gather the stories of those most affected by potential cuts for their members of Congress. STATE: FAN and its many policy partners are preparing for the 2018 legislative session, beginning Jan. 8. Some of our key bills will be on voting rights, prison sentencing, revenue and taxation, pesticide notification, and TANF monthly grant restoration. We are also busy scheduling in-district meetings with legislators and our faith advocates. U.S. Courthouse in Seattle to say #NoMuslimBanEver! We’ll also be celebrating the 30th anniversary of the Apology to Northwest Tribes, which has gained national recognition. Learn more at: fanwa.org/inic/.VENTS: At our Annual Fundraising Dinner on Nov. 19, FAN will be giving awards to those who have been indispensable this year in the work for justiceand equity. We’ll be honoring a founding FAN Governing Board co-chair; a network of faith communities that works for immigrant rights, sanctuary and rapid response; two Yakama tribal elders who have been working to dismantle the Doctrine of Discovery locally and internationally; and a Muslim faith community that has been exceptionally active in welcoming and serving their greater community, even in this difficult time for our Muslim neighbors. FOODSHARE: LOPPW is supporting a FoodShare healthy eating incentive pilot program that would give discounts on healthy food to FoodShare recipients who volunteer for the program. This would be the first of its kind in the nation. 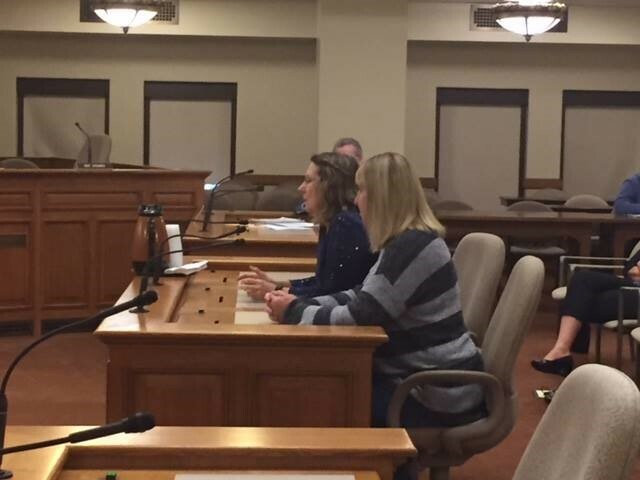 LOPPW does not support another bill that would add more mandatory limits to what FoodShare recipients could purchase. HUMAN TRAFFICKING: East Central Synod Women of the ELCA President Shirley Paulson and two other Women of the ELCA members, Deb Martin (also an LOPPW advisory council member) and Pa m Henkel, testified on a bill that would require education for commercial drivers to include training on recognizing signs of human trafficking. Shirley also testified on another bill that would help trafficked youth. While the director was attending the installation of Bishop Katherine Finegan of the Northern Great Lakes Synod, former adviser council member, the Rev. 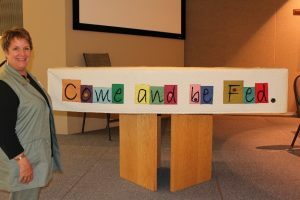 Diane House of the Northwest Synod, was a keynote speaker at the Eyes Wide Open Women of the ELCA event in the La Crosse Area Synod. 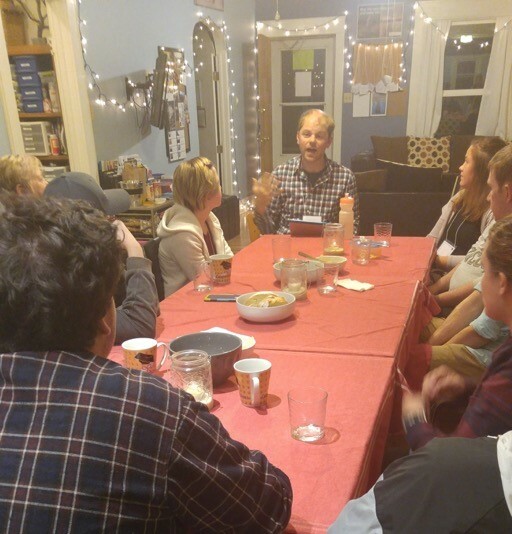 The director worked with members form Milwaukee, Madison and other parts of the state to lead a Wisconsin Climate Table retreat in Eau Claire. LOPPW advocated against a bill that would weaken sulfide mining regulations. LOPPW is making one last push to support a bill that would make it easier for utilities to assist low-income residents to get lead out of their pipes for drinking water. GOVERNANCE: We’re advocating against a bill that would bring us closer to calling for a constitutional convention.